Defending Champions, Bengaluru FC's frustrating run in this season of Hero I-League continues as they settled for a 1-1 draw against Chennai City at Nehru Stadium, Chennai. 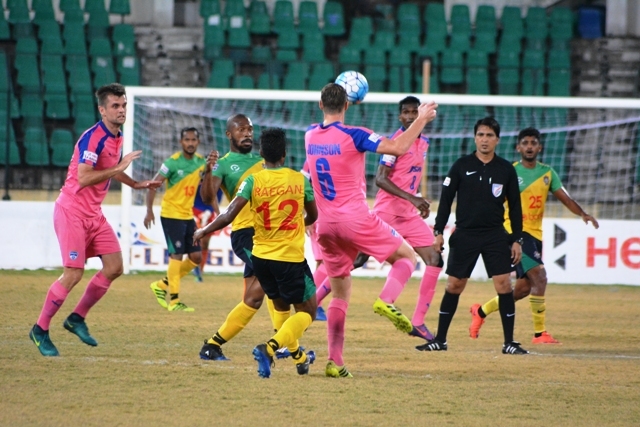 An own goal by John Johnson (53′) gave Chennai City an unexpected lead before Daniel Lalhlimpuia (58′) levelled the scoreline from an inch-perfect cross by Udanta Singh. Chennai City decided to pull out a few surprises by making three changes to the team that drew against DSK Shivajians. Marcos Vinicius, Joseph Clemente and Haroon Amiri were benched to make ways for Soosai Raj, Abhishek Das and Raegan Albarnas. Bengaluru FC made a couple of changes to the team that edged out Minerva Punjab in Ludhiana. Roca brought in Mandar Rao Dessai and Daniel Lalhlimpuia for CK Vineeth and Marjan Jugovic. The game started at breakneck speed with Bengaluru fashioning a couple of early opportunities. Udanta and Chhetri combined well before the Indian skipper laid the ball off for Mandar who had a clear shot at goal but Echezona came up with a brilliant block to divert the ball for a corner. Immediately after, Udanta sent in another cross which found Daniel inside the six-yard box. But before the youngster could sort his feet out, Echezona stole the ball away. The pattern of the game remained the same with Chennai holding off wave after wave of Bengaluru attacks. Chennai City, who were under the cosh for most of the initial quarter of the match, slowly started gaining a foothold in the match and fashioned their first chance on the counter in the 26th minute through Charles who made the chance by outrunning Juanan and Nishu on a breakaway and squared the ball for Raegan who was a bit early into the box and couldn’t meet it. Just before the half-time whistle, a poor back pass from Soosai Raj gave Bengaluru a chance to get a goal. Daniel latched on to it but a vital interception from Ravanan saw it abegging. The second half also started with Bengaluru dominating the ball but against the run of play, the hosts took the lead, albeit in fortuitous circumstances in the 53rd minute. Nandhakumar found some space down the right on a counter and the youngster sent in a dangerous cross which was headed into his own net by John Johnson, sending the home team into ecstasy. But it did not take the defending champions long to hit back. In the 58th minute, Daniel played in Udanta in the Chennai box with a clever chip and the winger flashed a low cross across but it was parried by Karanjit on to the path of Daniel who applied the finishing touches. But the game slowed down a bit after that but not before Debabrata had to come up with a goal line clearance off Johnson’s header that seemed destined for the net after Chhetri teed him off with a header. There was a controversy at the end of the game when Debabrata Roy appeared to handle the ball as he tried to chest a long ball to his goalkeeper and the shouts for a penalty fell on the deaf ears of the referee. There was more drama at the end when a header across the box from a free-kick looked set to be knocked in by Juanan but Ravanan came up with an acrobatic clearance to deny Bengaluru a winner. Chennai City looked extremely happy with the point while Bengaluru will be disappointed to drop points in a round where East Bengal and Mohun Bagan dropped points. Bengaluru FC have now 17 points in their kitty from 12 matches while the hosts Chennai City FC soars up to the ninth spot with 10 points having played one match more.